Last year my daughter asked if she could have her room updated as her birthday present, we always struggle to know what to buy so this was perfect. Having seen me produce them for every home decoration project Sadie soon set about creating her perfect mood board. She spent ages trawling through piles of Living etc, sourcing samples and creating a board on Pinterest, a day or so later her board was complete. 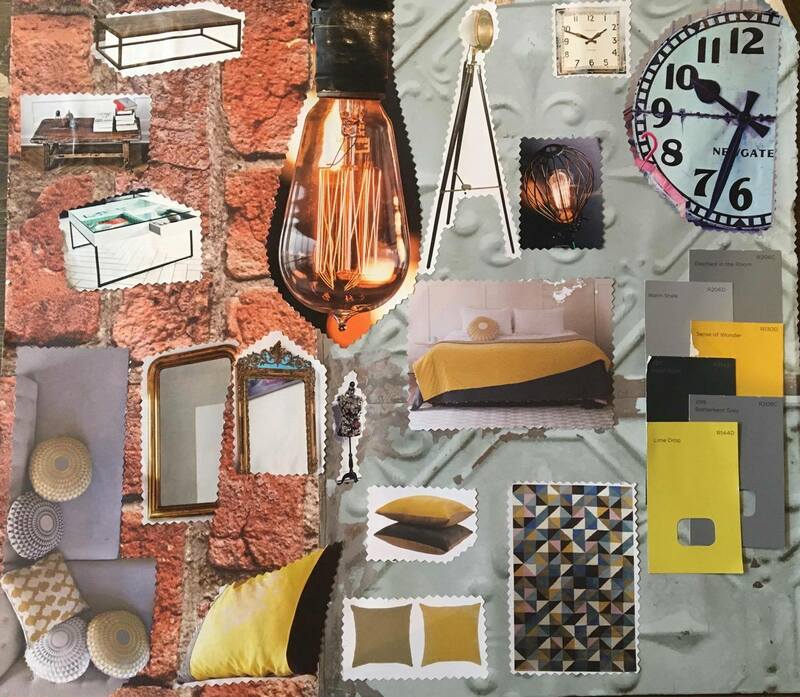 The look she was hoping for was New York Loft, think brick walls, shades of grey, wooden floorboards, industrial vintage, with a splash of yellow thrown in too. Once we had agreed on a wallpaper, a brick effect from B&Q we agreed that Sadie would move out of her room whilst it was done and not return until the big reveal on her birthday. Whilst the transformation was a birthday present I really didn’t have the budget to replace everything so employed lots of cash saving and up cycling tactics. The first of which was to look at the furniture situation, there were a number of vintage furniture pieces plus a large Ikea Kallax bookcase and a smaller one too as well as an Ikea sofa bed. Victorian brass bed frame and my Grandmother’s re vamped dressing table. The Ikea bookcases were rehoused in my office, in order to allow more floor space, this meant a good sort out was needed, items no longer used were either donated to charity or put into storage, we were ruthless. The Ikea sofa bed got to stay, so valuable for sleepovers and in dark grey already suited the new scheme. Next I tackled the other furniture items, a wardrobe, dressing table and chest of drawers, all of which were my Grandmother’s. These were painted bright pink, green and cream respectively but were given a new lease of life with Rustoleum Graphite chalk paint and a coat of clear wax. The wardrobe had always been problematic, due to it’s age it was shallow, which meant that hangers didn’t hang straight, which limited it’s capacity. The solution for this was to take the front off to open it up. The back was wallpapered to match the wall behind it so it looks like it’s backless, this made such a difference, it meant there was room at the bottom for folded items too. Bed wall with sofa bed and pink festoons and framed Vogue covers. I find curtains and blinds are almost always the most expensive part of redecoration, to keep costs down I used Rustoleum chalk paint left over from the furniture re vamp to paint the linen window pelmets (I must admit I was very nervous about this, but it worked a dream), I covered the existing roman blind with a lovely yellow linen from Dunelm (again I’d not done this before but thought I may as well give it a go and it was relatively easy). The other window in the room is huge, thankfully the same size as our guest room, which had light grey floor length linen curtains, I think you can most likely guess where this is going? Yes I used the guest room curtains, which are yet to be replaced! Prepare for an early morning if you come to stay! The bed is a 3/4 Victorian brass bead, which my parents brought up from London before I was born, I had it as a teenager and now it’s my daughters, had a few mattress changes in that time tough. It’s a great size, smaller than a double but big enough for an extra one when needed, so had to stay. 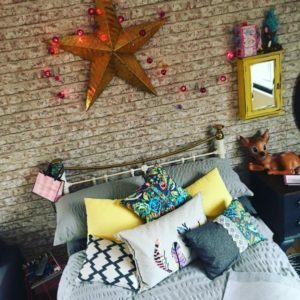 I found some gorgeous mid grey bedding at Home Bargains of all places and raided my fabric stash for suitable remnants to make lots of cushions. Two of the walls were papered in brick effect paper the other two painted in Farrow and Ball Down Pipe. Multiple mirrors and clocks had featured on the mood board, so whilst out car booting and scouting around the charity shops I picked up mirrors as I found them. These all went on one wall along with a gorgeous vintage gold mantle shelf that I’d used in our previous house. A gallery wall of photos and prints featured on another wall as did a collection of Vogue covers featuring the iconic Cara Delevigne. I donated a galvanised truck I’d been bought years earlier, my Dad added some industrial castors to it, it would now serve as a moveable coffee table in front of the sofa. My parents bought two fabulous industrial style wire shelving units as a birthday gift, these would house the edited possessions and ensure that there wasn’t too much room to get cluttered. I sourced a couple of great faux zebra rugs from Ikea and other decorative items from car boots. A lovely “Applause” light box by Temerity Jones added a cool vibe as did the simple Ikea light fittings, fitted with naked vintage style bulbs. It was very well received and overall a success as a year on it’s mostly kept relatively tidy, so I think she must still like it. When Heather Dixon visited to photograph our home for 25 Beautiful Homes I was thrilled with the photographs, featured above.